Termites are frequently found infesting homes and buildings, creating major problems for homeowners and tenants by actively feeding on timber structures like: homes, buildings, telephone poles, and trees. They will feed on almost anything made of wood. Within a colony of termites, you’ll find members of different social classes, each with a specific task to perform. Each class is reliant upon the other for the continued survival of the entire termite colony. The five different termite social classes include: the king, the queen, soldiers, workers, and what is called the winged reproductive which are young kings and queens dedicated to reproducing. If you suspect you might have termites, keep a lookout for the soldier termites. Because of their large numbers, you will likely see the soldier termites first. The soldier termite’s sole purpose is to protect the colony from any intruder. Anytime a termite’s habitat is disturbed, the soldier termites will scuttle out of the nest and guard the opening. Soldier termites have fat, dark heads with strong mandibles used for biting any predator that might threaten the colony. In some species, soldiers are twice as large as worker termites, and may spray noxious chemicals from a snout on the front of their head. The queen termites are responsible for helping the colony grow. A typical queen can lay over 2000 eggs a day, and she’ll live up to 25 years! That’s a lot of termites that can damage your property! Termite control must be aimed at eliminating the queen, as well as the other termites. 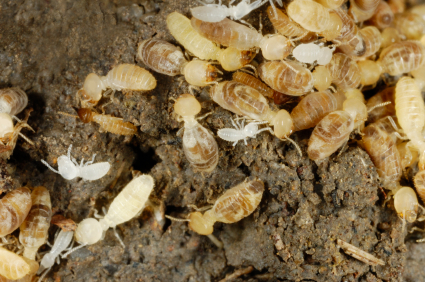 Worker termites help to build the nest, and will repair it if there is ever a breach. The worker termites are the termites that cause all the damage to your home. They spend their lives inside the nest eating, chewing, and eating some more. They are soft-bodied and will be a creamy translucent color. With the queen termite’s ability to lay 2000 eggs a day for 25 years, it’s a necessity for a pest control professional to eliminate this destructive pest before she, and the rest of her colony, create extensive property damage. Termites cause more damage to homes area than fires and storms combined. Yet termite damage is not covered by homeowner policies. 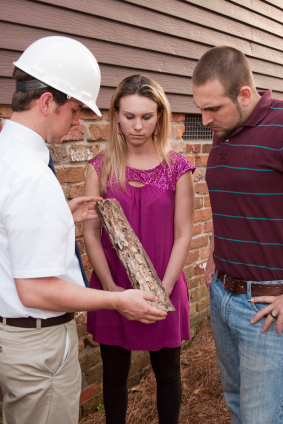 That’s why requesting a free termite inspection is so important. If you believe you have termites anywhere on your property, even if they are not yet inside your home, it’s best that you contact a termite control professional before they make their way to your all-you-can-eat buffet. The quicker you act, the more likely you will avoid any damage from being done to your home or property. Call for a free termite inspection today! When termite damage is considerable, it is dangerous. Termite damage can cause roofs and floors to collapse, and can turn joists, wall studs, and any other support beams into Swiss cheese. Termites once entered at your house then it becomes an unhealthy situation for your family. It is necessary to exterminate it quickly. I had no idea that termite queens could lay that many eggs a day. And the fact that she can live for 25 years is actually pretty surprising. When I think of most insects, I think of short lifespans, so it’s a little bit of a change in that department. In any case, having to deal with termites at all is a bit of a bummer, but these were some awesome ideas. Thanks for sharing! Very Interesting. Thank you for providing great insight into termite control. So many things I didn’t know like the amount of eggs a termite queen can lay a day.